It is here! 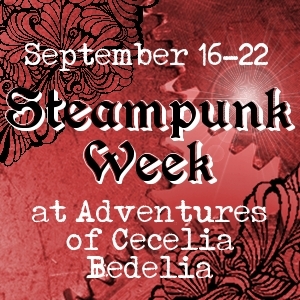 The Steampunk Week in September event at Adventures of Cecelia Bedelia will feature steampunk book reviews, giveaways and related posts from the 16th (today!) to the 22nd (next Saturday). Stay tuned each day for new content, and refer back to this post as needed – I’ll add each post to the list as it goes up. Oh, and check out the sweet weeklong giveaway below! This event will feature newer steampunk releases, but what about all those books from the past few years? You know, the books that brought attention to the genre and got people excited about the possibilities? They’re still out there, and they’re still fun. 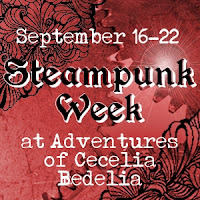 Today’s giveaway will feature the steampunk books I’ve reviewed over the last three years here at Adventures of Cecelia Bedelia. Want to win a book of your choice from the list above? Simply fill out the FORM. Giveaway open internationally, will end on September 29th at 11:59pm EST. Winner will be selected randomly and notified via email. Good luck! So tell me, what's your favorite steampunk read? I don't have a true favorite, but I just read The Friday Society on the flight to North Dakota and it's pretty awesome. Buffy-style dialogue, girls becoming superheroes . . . but there aren't enough explosions. I struggle to find steampunk novels that work for me, despite that I find the genre appealing (that makes sense, right?). However, I loved, loved, loved Meljean Brook's latest, Riveted (I'd liked the second book in the series, greatly disliked the first). I was completely swept away by the world and characters. Ahh. Thank you for this awesome giveaway. <3 Hmm. I would say The Iron Thorn :D So amazing. I loved Soulless, of course! Also, the Iron Thorn was really good. I adored The Boneshaker by Kate Milford, but Soulless remains my favorite! My favourite steampunk reads are Christine Danse's novellas, Kenneth Oppel's Matt Cruse series, Scott Westerfeld's LEVIATHAN series, and Gail Carriger's SOULLESS. There's tons of great short steampunk, too. I'm always so happy when I come across a story in an anthology or magazine, and there have been some great steapunk-only collections like STEAMPUNK!, STEAMPUNK (with no exclamation mark), and EXTRAORDINARY ENGINES. Souless was my favourite steampunk read, but all of Gail Cariger's Parasol Protectorate books are amazing.